Daddy Muffin had an evening errand to run, so it was just us girls home for the evening. For some reason I remembered I had some scraps of fabric I'd bought months ago to make dress up clothes for Muffin (but of course I never did make anything), and I thought, given Muffin's penchant for playing with fabrics, maybe she'd enjoy playing with these scraps. Sure enough, she had a blast! 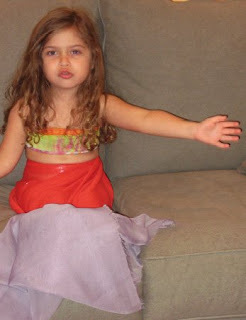 She decided immediately that these scraps would manke a great mermaid costume, so I had to go to work and dress her up - something to cover her chest, something for the tail, and yet another fabric scrap for the tail "flap" (or whatever its called). And she immediately proceeded to "play" the story of Ariel (with me providing the rest of the cast, per usual).